The last time Benjamin Netanyahu spoke to the joint Houses of Congress in Washington he was greeted with the kind of applause you would expect to hear if the Beatles re-united. He got 28 standing ovations in 47 minutes - there was hardly time for the audience to sit down between them. And when he rises to his feet to address the joint houses again on Tuesday he can expect the same levels of enthusiasm - at least from Republicans inside the chamber. Elsewhere the reception will be less enthusiastic. At the White House they will probably be watching in spite of themselves - but through gritted teeth. Back home in Israel Mr Netanyahu's rivals in this month's parliamentary elections will be watching too - and in a similar frame of mind. The National Election Commission is allowing the speech to be transmitted but with a five minute delay. That is meant to guard against the possibility that the Prime Minister might be tempted to use this global stage as an electoral platform. In practice, it is rather to hard to imagine anyone daring to pull the plug on Mr Netanyahu when he is in full flow. We will see. His subject of course is Iran. To his supporters Mr Netanyahu is something of a visionary on the topic, who has devoted much of his career to warning that the revolutionary regime in Tehran is hell-bent on acquiring nuclear weapons. They would see a parallel with the efforts of one of Mr Netanyahu's political heroes, Winston Churchill, to warn of the dangers of German Fascism in the 1930s at a time when most leading politicians in the Free World thought the threat could be contained by negotiation. To his detractors the Israeli prime minister is something of a broken record on the subject, who does not see the issue any more clearly than anyone else and who is hindering rather than helping international efforts to find a way of dealing with Iran. The leader of the Israeli opposition is Yitzhak Herzog. 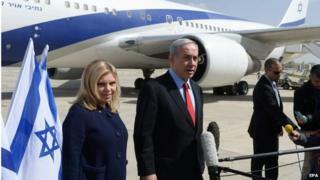 He will not be addressing Congress this week, of course, but he says he is just as opposed to Iran's nuclear ambitions as Mr Netanyahu and believes this trip is a mistake. "I have made it clear," he said, "that Israel will never tolerate a nuclear Iran [but] Netanyahu's trip is not going to help anything. If it goes head-on with the administration… it's only adverse to the basic interests of Israel." One point of agreement in all of this - March is a crucial month in the long negotiations between Iran and the group of six international powers trying to strike a nuclear deal with it. The group incidentally known as the P5+1 consists of the five permanent members of the UN Security Council plus Germany. Mr Netanyahu believes that the group is watering down its commitment to ensuring that Tehran never gets 'the bomb' and he intends to make sure that they do not. The White House believes Mr Netanyahu is interfering in American politics by trying to rally domestic opposition to its negotiating strategy. And it believes Congress is meddling in the Israeli elections by offering Mr Netanyahu such a prestigious platform two weeks before polling day. It probably also does not help, of course, that Mr Obama and quite a few of his senior officials clearly do not care for the Israeli prime minister. Maybe these personal considerations should not matter in politics, but they do. One of Mr Netanyahu's advisors, Dore Gold, says the timing is nothing to do with Israel's election - it is just that Iran is an important issue on which Mr Netanyahu has important things to say. "March is a crucial month," he said. "Unfortunately we have elections this month but he needs to tell his version of his understanding of the dangers of this agreement because Israel will be the first country to be affected." It is not unprecedented for an Israeli prime minister to fall out with an American administration like this but it is unusual and it is uncomfortable for both sides. The Netanyahu government may feel it can bypass the executive branch to some extent and talk about extra US funding for Israeli missile defence directly with Congress instead. But that is a dangerous game. Israel needs the White House and the State Department on board too - the close relationship with the United States is Israel's most important strategic asset and it cannot afford for it to go much more wrong than it has gone already. Mr Netanyahu may be backing himself to patch things up after the Israeli election - assuming he wins. But that is a dangerous game too. Mr Obama and his senior officials may be liberals but they might turn out to be liberals with long memories. That is for the future. For now Mr Netanyahu has to concentrate on making sure that a speech which has generated so much fuss and ill-feeling does not feel like a damp squib. Mr Netanyahu's office has released pictures of him working on the text with a pen, in long-hand in the style of Churchill. He had better hope that he is touched by the Old Boy's oratorical magic before Tuesday; this is one of the most important speeches of his life. Iran nuclear crisis: Can talks succeed?